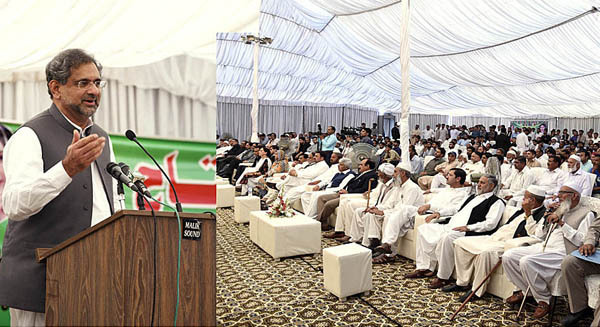 ISLAMABAD, May 16 (APP):Prime Minister Shahid Khaqan Abbasi Wednesday reiterated that Pakistan could only achieve progress and prosperity in a democratic system. The electorate would exercise their right to vote during the upcoming elections by choosing a representative government of their choice for the next five years. “The electorate will take a good decision and their verdict will be accepted,” he added. The prime minister was addressing the inaugural ceremony of Polytechnic Institute Maira Begwal. He said not only in the federal capital, but also throughout the length and breadth of the country, the Pakistan Muslim League-N emerged as the single ruling party which had executed mega energy and infrastructure projects. “There is a long list of such uplift projects completed during the last five years of PML-N government,” he added. The prime minister expressed the hope that the people in the area would massively support the PML-N and its candidates in the upcoming general election. On the occasion, minister for Capital Administration and Development Division (CAAD) Dr Tariq Fazal Chaudhry, Farhana Qamar MNA and director general Frontier Works Organization (FWO) Lt. Gen. Muhammad Afzal were present on the occasion. The prime minister lauded efforts of the FWO and said it would run the educational project whose idea had been floated back in 1985. He also recollected the events which led to collection of donations by the then members of parliament and the residents. He also appreciated the people of the area for donating a huge chunk of land worth million of rupees for the project. The prime minister expressed his pleasure that the project at last saw light of the day despite certain odds created in the past. He said the polytechnic institute would provide quality education and enable the people to get jobs in the country and abroad as well.